Pulchowk Campus, Institute of Engineering, Pulchowk Lalitpur announces admission for M.Sc. Programs for the Academic year 2075/76. 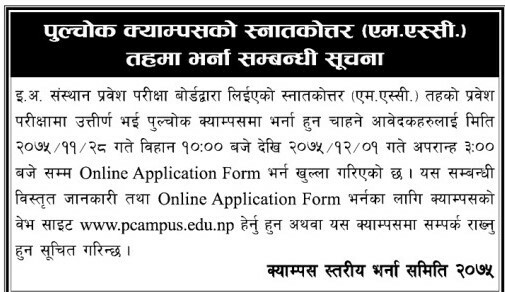 Candidates who have passed the entrance examination of Tribhuvan University, Institute of Engineering (IOE), Entrance Examination Board are requested to fillup the Online Application Form.